This outfit didn't turn out quiiite like I wanted. For one, it was beastly hot the day I wore it and I spent most of the day sweating off all my makeup and cursing the fact that I was wearing a silk floor length dress as a layer. I believe my face in the picture describes my excitement over it all. For two, I fried my hair doing straightening iron curls and it showed. And for three, Baby 2 partially ripped out one of my earrings a couple weeks ago and I haven't healed enough to wear earrings since then. I think a pair of earrings would have been nice. Despite all of the above, I did like this outfit and Aaron loved it so I count it a win. I'm super excited to see what you guys have done with this one! Link it up! Don't forget to stop by the Flickr group! CUUUTE shirt! You are so crafty. Oh OW. I've given up on earrings. I now have an extensive collection of studs, which is a bummer, because I LOVE big earrings. The shirt is adorable. Tutorial, please! I really like how you did this! I have a question!! I don't like being a day behind in the challenges, so is it okay if I combine two days (Day 7 and 8) into one outfit? shut up! My dressy + casual is a hanes tee altered by me and a skirt (to be posted tonight). You read my mind! Only mine doesn't have that sweet anchor on it. Awesome! CUTE! My idea is for a white tee + skirt too (to be posted tomorrow... on vacation equals bathing suit today! ), but I love your stenciled one! So creative. Is this the same thing you wore to dinner when we went in Utah? Wow what a calamity of errors you had to endure for this outfit. I bet you were hot with a t over silk! SOOOO CUTE! I'd love to see how you did the anchor stencil too. Sorry about the ear -- hope it heals up soon for you. I'm loving your blog~! Great outfit! I'm also a new follower~! Ooh, I didn't even realize that you stenciled your shirt! What a great idea! And I do love this silhouette. I love the anchor top! So cute! As for earrings, I can only wear them occasionally. One of my ears is allergic to most metals, and so I'm always having to re-pierce my one stubborn ear when I want to wear earrings! I LOVE that top. Did you just do it with a stencil and fabric paint?? I like it! That shirt is cute. I hope your ear gets better soon! That really hurts. Agh, I totally fried my hair doing straightening iron curls this weekend, too! I ran out and got some of that tresemme heat tamer spray stuff and made a deal with my locks to lighten up on the heated tools this week :) I think that tee is awesome, did you do a tutorial for it? 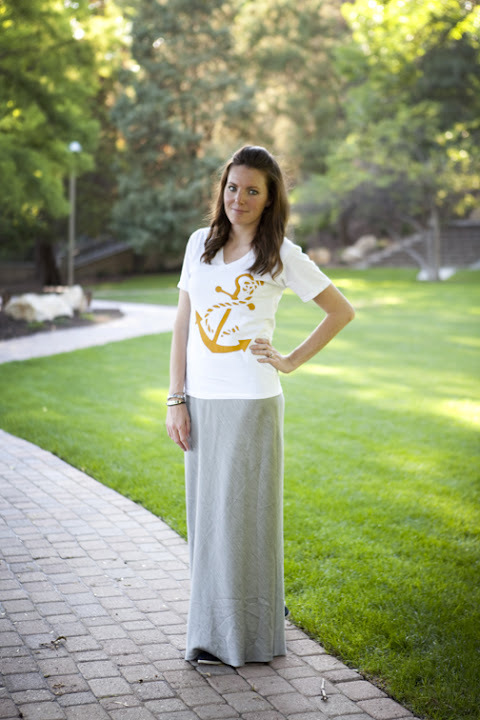 Love your anchor shirt, super cute! Question: What if we combine 2 prompts? Do we just select 1 of them to submit it to? That's what I'm assuming but just wanted to make sure! I love your shirt! I want one!